Christian Bale’s skeletal frame is almost unbearable to watch. For his role in The Machinist, he crash-dieted down to a shocking 120 lbs/55 kilos. This is one of many elements that give this outstanding mystery thriller its ominous, dreamlike tone. Bale’s performance is pitch-perfect. The screenplay by Scott Kosar original and mysterious. The desaturated cinematography by Xavi Giménez grim and menacing. The strong supporting cast includes Jennifer Jason Leigh and Michael Ironside. These elements are married together perfectly by Brad Anderson’s direction. 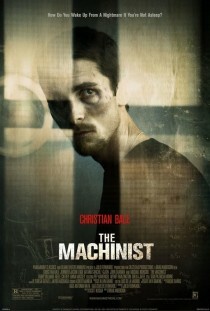 The Machinist: one of the best films of the past decade. Absolutely love this film, watching Christian Bale in the state he is in here is always a bit disturbing, but always so effective. I agree with all you say about this film. I kept looking at his body and thinking, oh God, can he really be that thin? I think it a masterful film. The atmosphere is stifling but it’s all so intriguing. I’ve seen it twice and I haven’t finished with it yet. Christian Bale is pretty interesting in American Psycho too, though it’s a far different kind of performance than in The Machinist. LOVED it! Everything about it! Watched it 3 times this year… And the soundtrack is great!